Climb to the top of this Mind blasting ride and take a leap of faith jump with no safety nets, no ropes and no bungee cords and only the safety of the large stuntman bag at the bottom of the cliff !! Let the awesome Mindblaster blow you away with a thrill you can only get on this new ride available only at Number 1 Party !! Disregard the noise in the video that is due to us running them in slow motion it is not part of the ride. Have a BLAST on this AWESOME new combo ride !! Jump and slide on this cool ride !! Climb aboard this awesome school bus inflatable ! 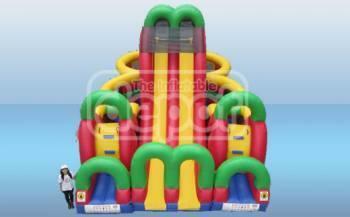 Bounce, climb, slide or even have a seat on board this fun filled adventure ! You can prentend that you are the student or pretend that you are the driver !! Mesh top and mesh side windows makes this a cool ride on hot days. Great for pre teen and down age groups. Call today to reserve your date. This new fun and exciting game is a blast ! The Zombies may be laughing now but you and friend will have the last laugh ! Unload your guns on the Zombies and put them out of their miseries !! Book this awesome game today ! A great two man game for all ages even adults ! WOW ! Enter at your own risk !! Someone in this room has been bitten by Zombies but who is it ?? Take cover and fire at will !! Take no prisoners because you could be the next victim ! This game is for 4 players at a time and comes with an enclosed arena....great fun for ages 5- Adults ! No triggers to pull just aim and drop the nerf style balls into the top of the gun. We have video clips we can text you for a better idea of how much fun this game is. Before we even placed this item on our website we were already taking reservation for events so book today ! Make your party Number 1 with this 2014 IAPPA award winning game. The IAPPA award is the highest award you can receive in our business so book with confidence ! !